Hot Stone Massage is a luxurious form of thermotherapy, which is the application of heat to the body for pain relief and health. Heated stones are glided over the muscles, providing a deep, penetrating heat that results in a state of deep relaxation. Hot stone massage causes the blood vessels to open up, increasing circulation. Wastes such as lactic acid are carried away, and fresh oxygen is delivered to the cells. Muscle tissues release tension and relax. Pain sensations fade away and moving around becomes easier. Hot stones were used by Native Americans who called them the “stone people.” They consider all stones to be “record keepers” that allow the patient to remember lost truth. Hot stone massage is similar to a regular Swedish massage, but smooth, flat, heated stones are included. These stones rest in 130 degree water, in a large electric roaster. Your massage therapist will always hold the stones to check their temperature before using them for massage. If it ever feels too hot, please say something. Hot stone massages usually start with the client face down on the table. The massage therapist spreads oil with Swedish massage strokes, then massages with heated stones. Stones are replaced as they cool off. Stones may be placed on different areas of the body: spine, belly, feet, between toes. Stones are cleaned and sanitized after every treatment. A hot stone massage will send your body and mind on a vacation to another time and place. You will feel a deep sense of relaxation and contentment for hours afterwards. Call Woodstown Massage Boutique (856) 769-1373 and book your hot stone massage today! 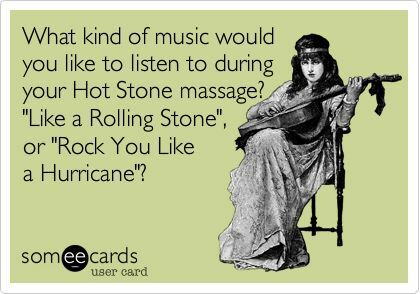 If you have any of the following conditions, a hot stone massage wouldn’t be recommended. If you have a chronic condition please check with your doctor first.